Tarzan Shoes is situated in Tulbagh, a secluded valley, approximately 120 km north of Cape Town. This historical town was extensively damaged during the 1969 earthquake, and many of the old buildings—mostly Cape Dutch—were all but destroyed. Due to the committed community, many of the buildings were saved and restored to there old-world splendor. 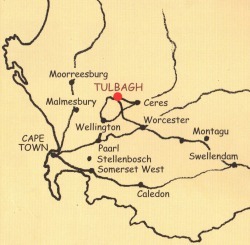 Today, Tulbagh is renowned for it’s beautiful architecture and unspoiled fauna and flora.